The bibliography of Enid Louise Cushing (1915–1983) points to a most unusual literary career. 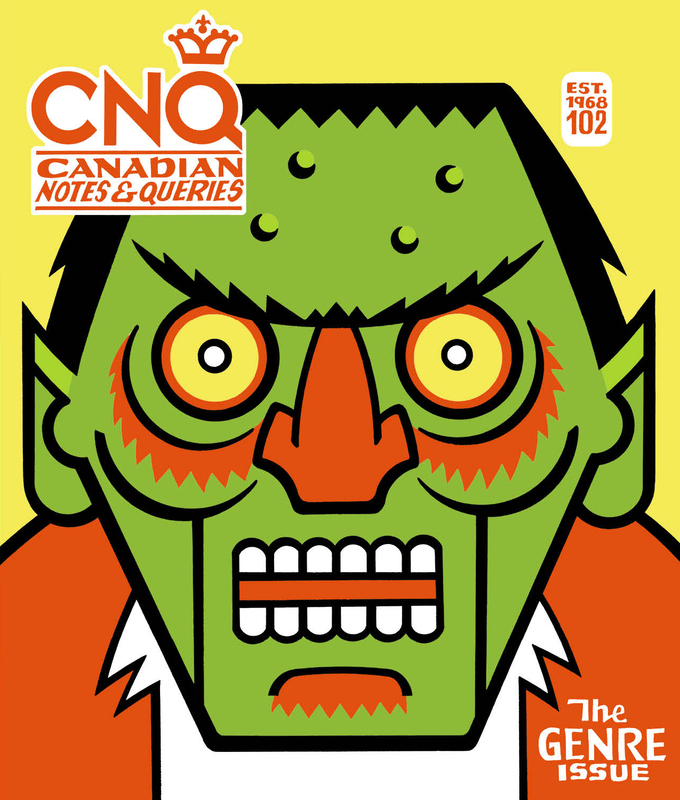 In the mid-fifties, the Montrealer published five mysteries: Murder’s No Picnic (1953), Murder Without Regret (1954), Blood on My Rug (1956), The Unexpected Corpse (1957), and The Girl Who Bought a Dream (1957). There followed a twenty-three-year silence that was broken by a second flurry of activity. 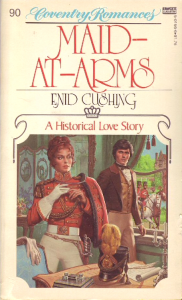 The first book in Enid Cushing’s second act, Maid-at-Arms, a romance novel co-written with celebrated science-fiction author Andre Norton, appeared and disappeared in 1980 as a Fawcett mass-market paperback. 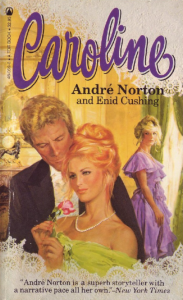 Norton’s name doesn’t feature on the cover, but it does on the next book, Caroline (1982), which would turn out to be Cushing’s final novel, published just months before her death. 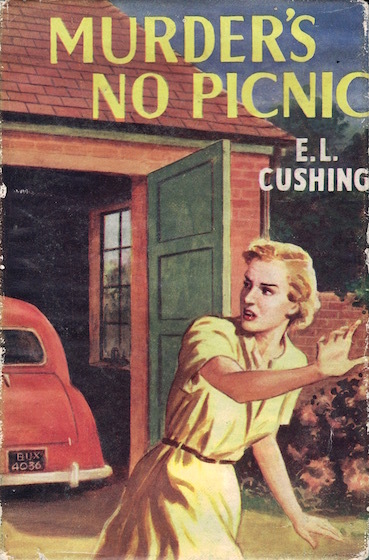 Murder’s No Picnic, Cushing’s debut, holds the distinction of being the only one of her seven novels to have been published in England. I bought my copy for its dust jacket, which features heroine Dorinda Connors fleeing in a frightfully ugly yellow frock. The anonymous artist has caught something of her appearance—”nobody has ever told me I was beautiful”—but has failed with the garage, which should be of stone and built into the side of Mount Royal. About the car I can say little other than that its license plate doesn’t look anything like those issued in Quebec, the province in which this mystery takes place. Mrs Peterson was a young woman when her husband died. She never had children, but raised a nephew and two nieces—Peter, Anna, and Donna—after they were orphaned. A fourth orphan, Geoff Richmond, joined the rest after meeting and becoming pals with Peter in the RCAF. Though young adults, all four continue to live in the expansive Peterson mansion on The Boulevard, and all four are at the Peterson country house when Dorina and Mrs Peterson arrive from their wonderful five-week tour. With servants Abbie and Clarissa, and the respective romantic partners of Peter, Anna, and Donna, it’s a full house. Murder’s No Picnic features no picnic—title aside, the word doesn’t appear in the novel—though there is a murder… followed by another. As expected, Mrs Peterson is the first to go. Dorinda discovers her body in one of the screened porches, slumped over a writing table with a knife in her back. She runs to tell Geoff, who takes charge of the situation by phoning the local doctor and the police. This being a country-house mystery, the only suspects are the servants and those staying at the Peterson summer place. Detective Inspector Armstrong of the Quebec Provincial Police informs the household that the couple living along the road leading to the property didn’t see a car pass in advance of the murder. Neither he nor anyone else considers the lake and surrounding woodland. The investigation becomes bogged down in repeated interviews with the suspects, all in the hope that the murderer will trip up. No one does. Some momentum is gained when the action shifts to Westmount, and Dorinda discovers the second body in the trunk—the illustrator may have preferred “boot”—of a car in the Peterson mansion’s garage. There’s also a bit of intrigue involving the ownership of a boat moored at the Royal St Lawrence Yacht Club, and some illegal gambling on the waters of Lake St Louis, but none of this is particularly riveting. I found myself focused on a far more intriguing mystery. 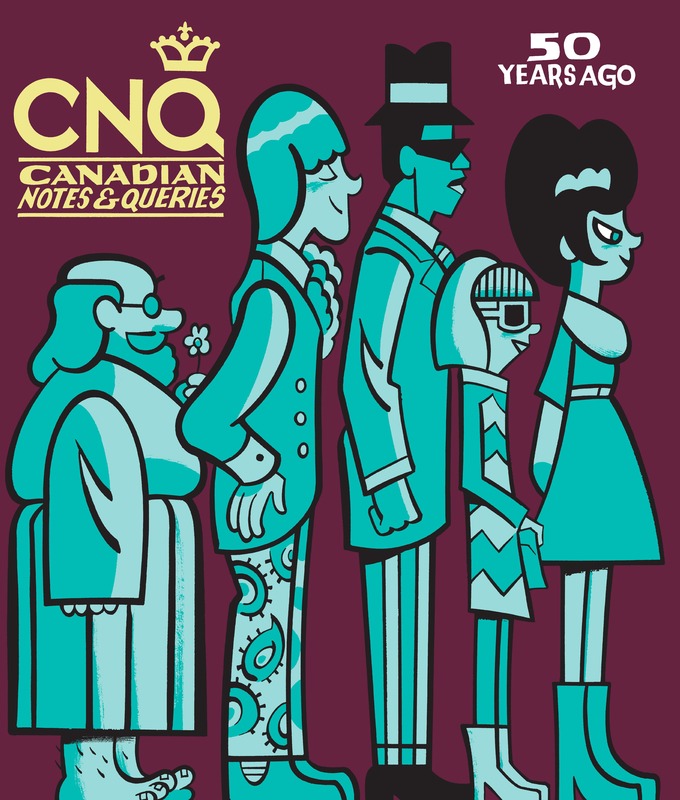 How was it that Enid Cushing, a forgotten writer of obscure mysteries, came to collaborate with a writer of Andre Norton’s stature, Norton being the first woman to be inducted into the Science Fiction and Fantasy Hall of Fame? Consider me on the case.